"A scary glimpse into the truth behind "frenemies."" First and foremost, we must consider the fact that Brenda Novak would never write a crime novel that easy to decipher and solve. So even though she is throwing facts and clues at us remember these are not random. They are deliberate so pay attention. 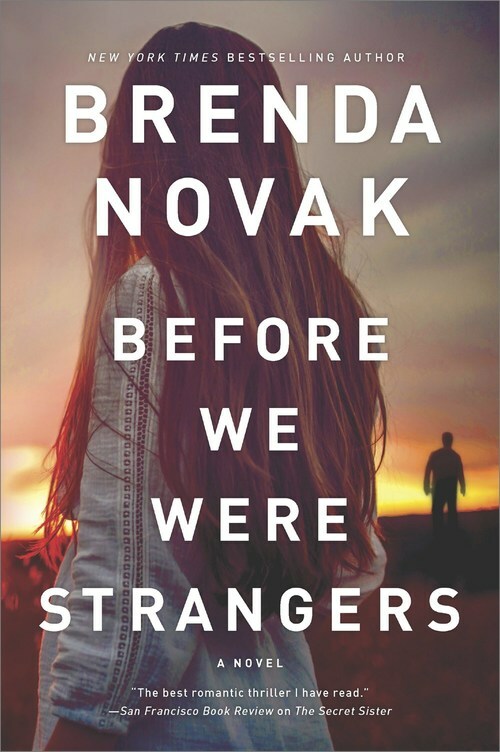 Brenda Novak makes you wait for that ah-ha moment and that has never been clearer than in BEFORE WE WERE STRANGERS. Sloane and her brother Randy basically grew up without a mother who went missing when they were very young. Clara was simply missing. For some odd reason, her disappearance did not make many waves. It seemed to be widely accepted which made it all the more odd, eerie and needless to say strange. Sloane was five and all she can remember about the night Clara went missing are some disjointed noises and pieces of a puzzle that were confounding, to say the least. At eighteen, Sloane left Millcreek never to return. Her suspicions about her father's role in Clara's disappearance had reached the point that she herself feared the man. Ed McBride had always been ambitious and ruthless but was he also capable of murder. It was widely known you don't cross Ed. Returning to Millcreek was filled with problems. No one there would be welcoming. As far as Sloane knew only her old friend Paige was glad to see her offering a place to stay when other options slammed in her face. Millcrest was not happy to see Sloane McBride return and the list of folks that either turn their backs or outright warn her to leave grows with each day. But Paige and Sloane have a history that makes any return to anything even remotely resembling friendship questionable at best. Paige is now divorced from Micah, the young man and love Sloane left behind, and they have a young son, Trevor. Paige has been weaponizing Trevor against Micah and to this day, Paige holds Sloane responsible for the demise of her marriage. Micah never got over the loss of his first love, Sloane. Paige had to be happy with the crumbs, so to speak. Paige is truly torn between missing her best friend and despising her. The number of people that seem guilty just keep growing. All sorts of stories are told to Sloane and most point to her father. But without evidence, there is no crime to investigate. Hearsay doesn't count. Sloane needs concrete evidence even if it ultimately does support the guilt of her own father. With few, if any folk legitimately supporting Sloane's search the only person who seems willing to help is -- you guess it: Micah. And Micah is the one person that Sloane does not want to drag into this problem. He definitely has his own issues to resolve. So BEFORE WE WERE STRANGERS is quite a study of small towns, small minds but long memories and revenge. Brenda Novak draws a picture that isn't really that pretty. BEFORE WE WERE STRANGERS pits one person against an entire town. That is until the fabric of that town starts unraveling before our very eyes. Re: A scary glimpse into the truth behind "frenemies."